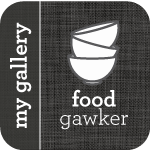 Every food magazine and many websites I’ve looked at over the past few weeks have been excited about spring and all the great produce we can now cook with. Asparagus, artichokes, strawberries and green peas are all featured in spring recipes and I’m as excited as anyone about cooking again with fresh local produce. The only problem? For most people living in Canada and the northern United States, these items won’t be available for a while. So why not make the most of what little we do have? Wild leeks (a.k.a. 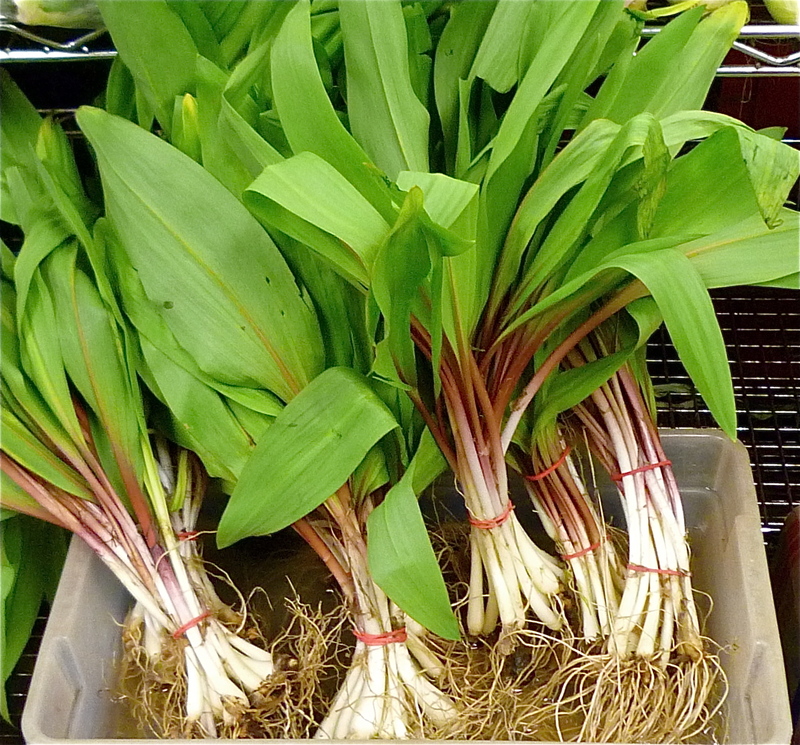 ramps) are in season now and they are a flavourful and versatile spring treat. They look like leafy green onions and taste like a mix between garlic and onion. The entire plant is edible and can be used in everything from salad dressings to pasta sauces. Unfortunately, ramps aren’t available everywhere and they can be hard to find even in areas where they do grow. Farmer’s markets are the best place to find them – they likely won’t be carried by major grocery store chains. I typically purchase them at St. Lawrence Market in Toronto. Wild leeks, which are also known as ramps. This recipe is very rich so it’s best served in smaller portions. However, the recipe can easily be doubled if you’re feeding a crowd. Heat a skillet or large saucepan on medium-high heat and add bacon. Cook until cubes are crisp and browned, about 7 minutes. While the bacon is crisping, prepare the pesto. 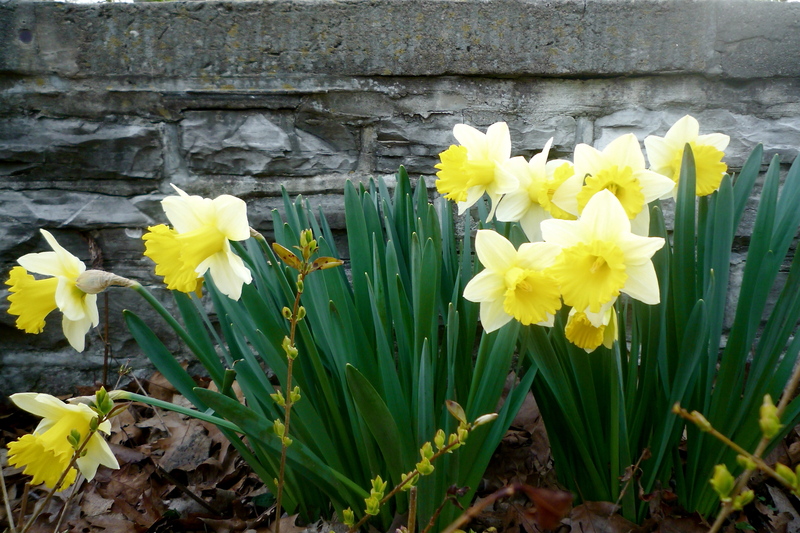 Trim the root tip but preserve as much of the white bulb as possible. Wash and dry the leeks carefully, making sure to get all of the dirt out of the leaves. Chop the leeks into three or four pieces and place in a food processor or the chopping cup of a hand blender. Add oil and a pinch of salt. Pulse until the wild leeks are fully chopped and relatively smooth. It should look like coarse pesto. Drain any excess fat from the crisped bacon. On medium heat, add the wild leek pesto and stir fry for about 2 minutes to get rid of the sharp ‘raw’ flavour of the leeks. Add cream and stir until the sauce is thoroughly combined. Heat until the cream is just warmed through, about 1 minute. Stir in parmesan and season to taste with salt and pepper and remove from heat. Cook spaghetti according to package instructions (see How to Cook Perfect Pasta for tips). Drain and toss with creamy pesto sauce. Garnish with a wild leek leaf and serve with extra parmesan if desired. OPTIONAL: To make a vegetarian version, omit the bacon. Add two teaspoons of olive oil to the skillet and sauté the pesto before adding cream and cheese. 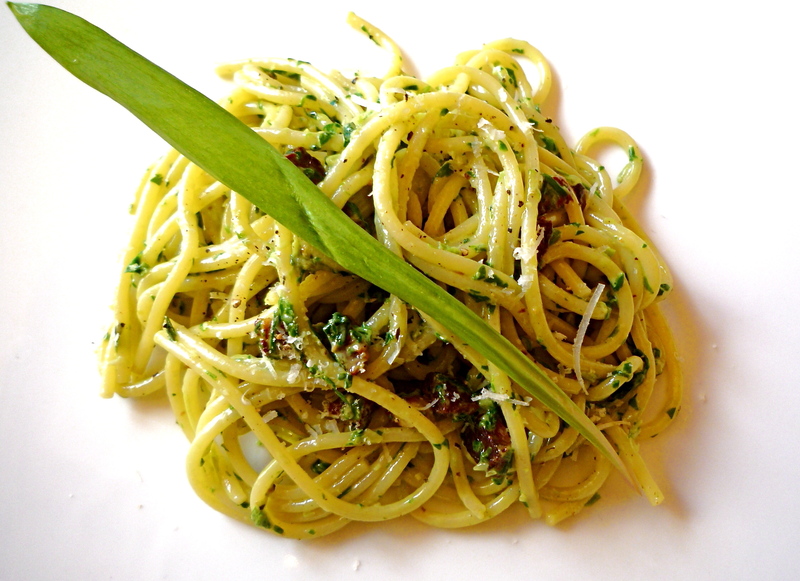 Spaghetti with Creamy Wild Leek Pesto is a decadent and delicious spring dish.